Data on environmental data from the U.S. EPA. These data are integrated with other data sources to reveal connections to market development and public policy. 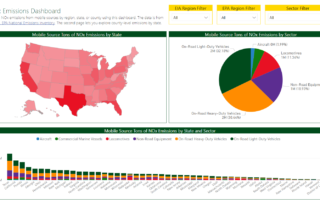 Explore NOx emissions from mobile sources by region, state, or county using this dashboard. The data is from the U.S.EPA National Emissions Inventory. State-focused dashboards are also possible (New York is provided via the second page of the dashboard).